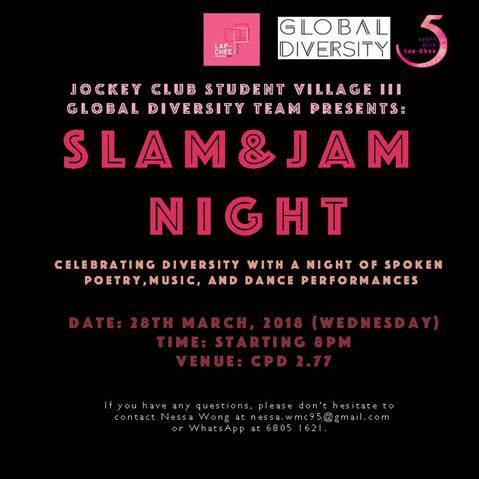 Global Diversity of Lap-Chee College Presents: Slam & Jam Night! Spoken word. Electric music. Fiery performances after one another to shatter boundaries. Disrupt the silence. Start a conversation. Back by popular demand, Lap-Chee College’s Global Diversity team is proud to present the second edition of Slam & Jam Night! Join us for an evening where our urban artists will come together to voice out their thoughts on social issues and related personal experiences. There will be poetry readings, music, dance performances, and even a magic show! This semester’s theme is Relationships & Connections. There will also be an open mic session for the audience after the scheduled performances. Please drop by and support us! For those of you who are interested in performing, we still have some vacancies available. Please fill in the details of your performance in this form ASAP: https://goo.gl/forms/kdBC5OMonhbQPjaH3. We’d love to hear your voice!